Available dimensions: height 73cm, top 60x60cm, base 45x45cm weight 15,90kg - height 73cm, top 70x70cm, base 45x45cm weight 18kg. Available colors: white, silver grey, black. 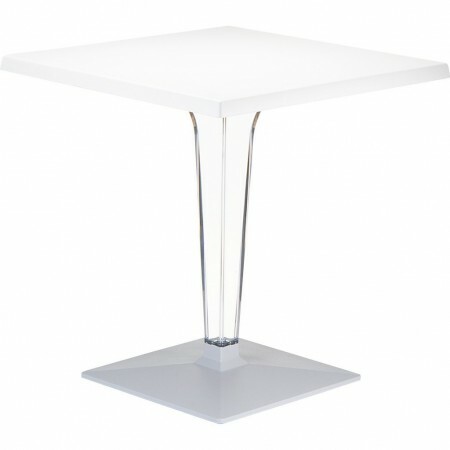 ICE is an elegant and robust square table, available in 2 different sizes. Thanks to its solidity and the possibility of being used also in outdoor settings, ICE is an excellent solution in the furnishing of patisseries, ice-cream parlors, bars or cafes. ICE consists of a square base in painted aluminum, central column in transparent polycarbonate and top in robust Werzalit: anti-scratch material based on wood and extremely resistant resin, does not fear humidity and heat, designed to withstand even atmospheric agents.